This Website is Under Site Construction, It will be done when its done, which should be soon! I did have the top nav bars as java highlighters but... well, java doesn't like to load 90% of the time, so java is out. faster load times are IN! I Added the Cool looking design on the index page, I hope you like it, It just came to mind.. oh well, Onward Ho! More of the site coming soon! The Compu-Comics Interactive Site is pretty much finished, I also fixed up the Starfleet Missions II Preview page and the Download page for Starfleet Missions Episode I. You can get to both pages via the Compu-Comics page. I changed the entire nav bar interface, I just needed more buttons.. don't we all? Also added many other areas back, which were gone for awhile, and added more screen-shots for Starfleet Missions II Preview. 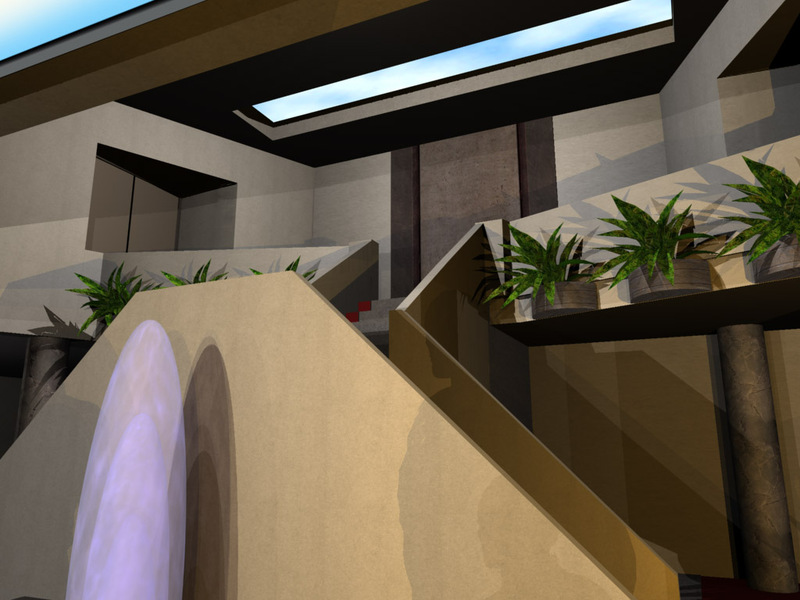 The 3D Starship Archive of Rendered Images is now all Online! Also, Download the NEW Enterprise 1701-E Object For Truespace3! Its much better looking now, and Looks Correct. 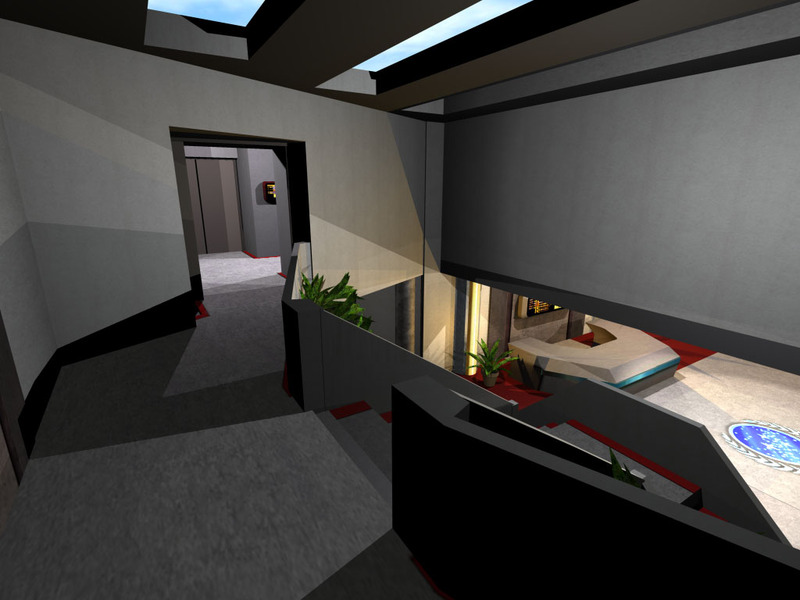 The Updated Enterprise 1701-C Starship Mesh for Truespace3 is finished and online. Get it at the TS Object Archive, Visit the Site of the Week, each week I add a new Site, and keep all the others in Archive so you can see past Sites. I added the Akira Ship Pictures to the 3D Starship Archive, and added some NEW Rendered Images in the TS 3D Gallery, Take a Look! I am almost Done with the Akira Model, Download it August 10th. If you want to see what it looks like as of 08/05, scroll down a bit, or go to the TS Object Archive, I updated the Akira Image, I am in the process of Adding the Guestbook, I just need to contact someone to modify my INI file. 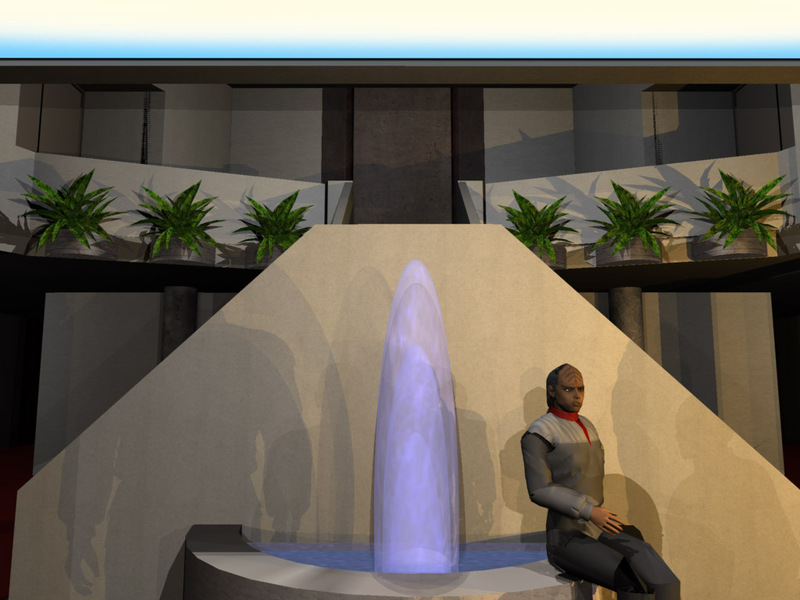 I updated the Gaming Paradise area and the Trek Scoop now has MORE Startrek Spoilers for Deep Space Nine and Voyager! The Akira Class Starship is complete, and Online, Also Uploaded the Animation for it, its a simple animation showing all angles of the ship. The Model is 503k and requires Truespace3 v3.1, Go to the TS Object Archive to download the model and animation, or to the 3D Starship Archive and view the Akira Renderings, and many other ship types. Star wars News: Star wars Episode I Release Date Set for May 21st 1999! My MIRROR Website, is Online now, go bookmark that site as well! Added more Files to the Site File Area. The Akira Class Truespace3 Mesh with all it's Textures is Online For Download, its 503k, also I uploaded a 1.5MB Animation of it! Go Snag it at the TS Object Archive! I am looking for sites to host some of my trek files, only as backup mirror sites, so if one site is busy, or down, they can get the files from another source. Email me if you can help! I totally redesigned the TrueSpace Object Archive, All NEW Layout to display the ships! Also, I redesigned the LINKS area, ya gotta go look.. much better looking.. Also Remember to check-out Gaming Paradise, Many things are being adding this weekend! The Guestbook is now Online, and Working, Please Sign it! If you haven't already, go to the NEW Akira Shots in the 3D Starship Archives, I updated the Akira Starship Section with Zoom in's and new angles. I have added some more Links below, and some Great Sites to visit in the "Programs You Might Need" Area. I am Also still working the NEW Meshes! I am back from vacation, and will be updating the site daily again.. If you wish to see that Leonid Storm via Real-Video, CLICK HERE. I have added 3 new Starship's to the 3D Starship Archive Gallery, and updated the entire site with new graphics! Check it out! Checkout the 2 NEW Ship Meshes I will be making very soon, the New Delta Flyer, and the Borg Sphere. Go to the Object Archives to see what they will look like! I have added 40 New screen-shots for the Episode of Voyager "Drone", Go Check them out! I have updated the Site of the Week, its a Xmas Related Link, and each week I will have another Xmas Link until the 25! I will be uploading a few new Rendered Pics to my TS 3D Gallery, and a few new sets of ships to the Starship Gallery. I uploaded a NEW Alien Starship to the Object Archives, go Download it ASAP! Also, I added Startrek Insurrection Pic's from the Behind the Scenes Show that was on E!. I have totally redesigned the Baldur's Gate Area, now with four series of portraits. Check out the TS Object Archives for some great new stuff that will be added Jan. 1999! I am about a week or so away from releasing a NEW Starship to the Object Archives, stay tuned, I want it to be a surprise! Also, If you play Baldur's Gate, Check out my BG Site, The Ironwork's. Many hours have gone into this Support site, and has gotten INCREDIBLE Hits! Welcome to Version 4.7b of the Website! It is now in full 800x600 mode, 96% of the users that visit here, are at least at 800x600 or higher. Some areas are still under Conversion, and will be finished up by Friday the 19th. Please, give me some feedback, and let me know if you like this new look, I am very interested! I have added March's Site of the Month, check it out, its a cool site! I have Released the Borg Sphere Mesh for trueSpace3, its 633k! I am now working on Converting Trekker's Tavern, Gaming Paradise, and REALLY making Starfleet Missions II Preview area better, and a slew of NEW Screen-shots! I have converted the Compu-Comics site, Check it out if ya want, it looks pretty good, its almost complete too.. I have updated the 3D Starship Archive with 3 NEW Ships, the Steamrunner, Saber, and Borg Sphere.. Check 'em out! I have a Surprise, I am ALSO working on the Saber Class Starship Mesh, along with the Steamrunner, BOTH will be released on the same day also! I will be Closing the "Trekker's Tavern" Page, and Replacing it with a HUGE Need For Speed page, Trek scoop will Remain, and Has the latest news, and Rumors. Updated the Trek Scoop! Get all the latest Startrek info on DS9 and Voyager! Many Spoilers! Also added the Sim City 3000 Link to the Bar on the Right. Progress on the 2 new Starships is going well, I have been busy with work at stuff so its taking more time to finish them. I have Upgraded the Website to Version 4.8, and the Code has been Cleaned up a lot, and most areas will load faster. With this Upgrade, You will Notice that the "Home" Button is Slightly different, and the NEW Area, "Need for Speed" has been added That Area will Open on May 1st! Enjoy, and Please Email me if you see any Errors or Bugs. Updated the 3D Starship Archives with the NEW Steamrunner Ship, Check it out from ALL Angles, with 4 Zoomed in areas! I have added EVEN MORE new Screen-shots of the Stargate, I have added 4 More Renders to the 4 I added 2 days ago. These new Shots show the New additions to the Gate.. I have Added 4 NEW Preview Screen-Shots of the Stargate, And Updated the 3D Starship Gallery! Check them Both out! I have released the Saber Class Starship! Its in 2 Formats, Truespace3 (With Textures) and DXF, with no textures - Anyone that would like to make a Lightwave Conversion, Email me! I have added a ZIP full of 360 Road sign Textures, all are in TGA format, Get them Here. I have added 1 final render of the Stargate before its release to the public, take a look at it Here, it now has the Ramp and Lights attached. A few more tweaks are needed, then it will be released. Rendered a NEW Image tonight, its entitled "Road Work" View it Here 227kb and a Newer one Here. Almost complete on the Stargate! Should be online Very Soon. The Ironworks Area has had an ENTIRE Site Update, check it out if you like RPG's. - The New Sections like Darkstone, Neverwinter Nights and Planescape will open August 18th. I have added 16 NEW Links to the Cool Links area, check them out, if you have time, there are tons of great 3D Mesh sites listed as well. Finally got the Domain name, now in the coming weeks I'll be adding TONS of new stuff to the site, Remember to Re-Bookmark this New URL!! The Stargate Mesh has been Released to the Public! Go to the Object Archives to Download it. Remember, if you Haven't Done so, Sign the Guestbook, I'd Love to hear from ya. I have Uploaded all 5 TNG Movies that I made in Deluxe Paint Animation in 1993-94, REMEMBER, this was when I just started, But the 5th movie isn't bad at all.. Its on par with Starfleet Mission I.
I've added the first model for the Non Sci-Fi Models Area, Its a Mitsubishi-Truck.. More Later today and every day! Just an update for April 7th: I've been working on revamping the 3D Starship Gallery for a few weeks now. The area will have a new web design, new renders/pictures of each Starship (Newer models as well), and lots of NEW stuff as well! I'll be adding this in a few days!! I've added a NEW 3D Model to the Object Archives (One of many being released this year!). It's the USS Pasteur Starship, and has all the high-res textures included. If anyone wants to do a conversion for me, let me know via email. More soon!! I'm back from Vacation, and wanted to remind you guys that I'll have some New Models Soon! One of the models I'm working on is a prototype that was to be Voyager, but wasn't picked as the design. Its a really cool looking ship! A few of you have told me that the Stargate mesh is creating problems when being loaded. The mesh is extremely detailed (near movie quality), and takes a powerful machine to load it up. I'll be designing a lower poly-count version though soon. Hey all, just wanted to give you guys an update on the goings on here.. its been slow here, but every summer I take some time off from the site and relax a bit. but its soon over! And you'll see lots of new models coming up! The new delta flyer is on my mind now.. I wonder what it'll look like! We uploaded a preview of what the new look of TGEWEB2K will look like, its just a screenshot, not all of the buttons are finished, but its nearing completion. The NEW 3D Model is online for Download, its 900kb so go snag it now, if you can do a conversion for me to Lightwave, and/or MAX let me know, you can email it to me. 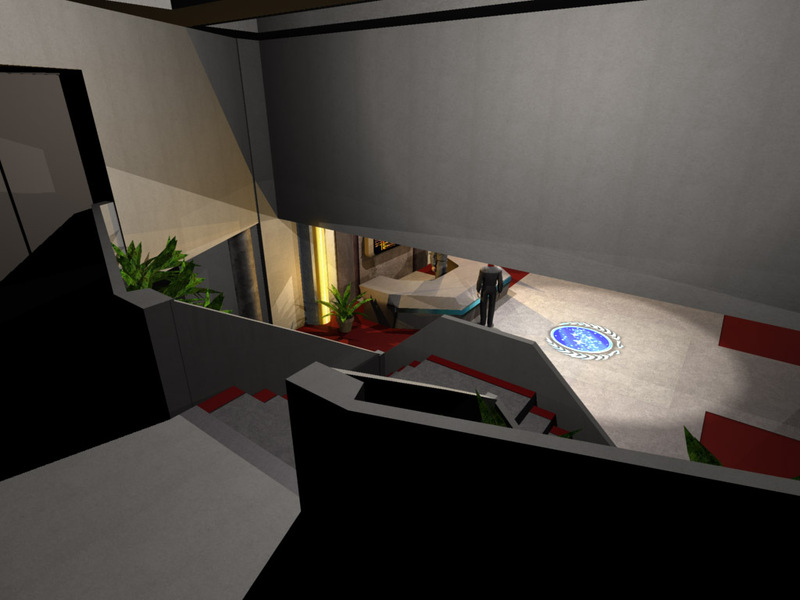 I've rendered a new area of the Conference building for you, I added a few more rooms to it. View the Pic Right here. We'll be adding a NEW Model Friday, its a new type of shuttle, its a tanker/transport shuttle. I'll put some screenshots of it up tomorrow as well! 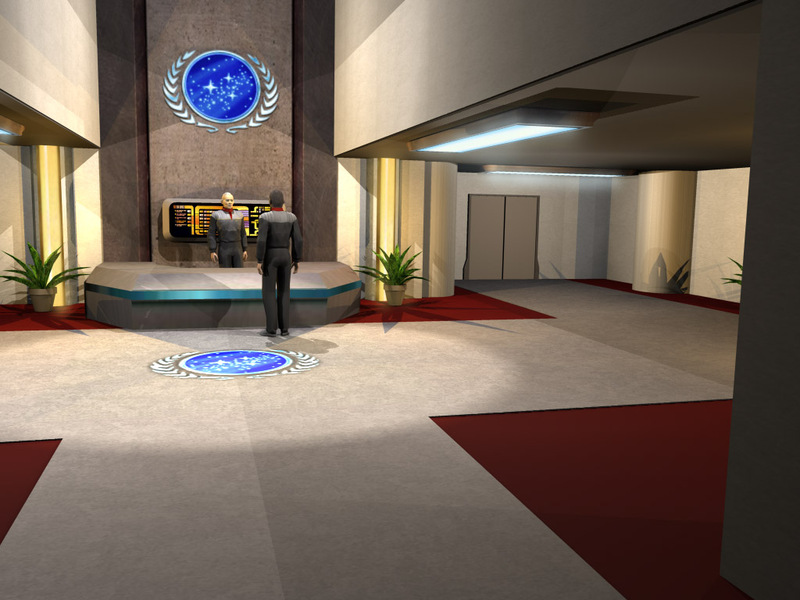 I've added 2 NEW Images to the 3D Gallery, check them out.. One is a render of Starfleet Academy, and another is of the kitchen in my old house..
Download the Short Animation of a set for Starfleet Missions II, its a Conference Building at Starfleet Academy, You'll need the DivX Codec to Play this AVI, so go Here first, then Download the Animation Here (1.8MB) when you're ready! (The DivX Codec is AMAZING, rendering in this Codec creates DVD like quality while keeping the size amazingly small! 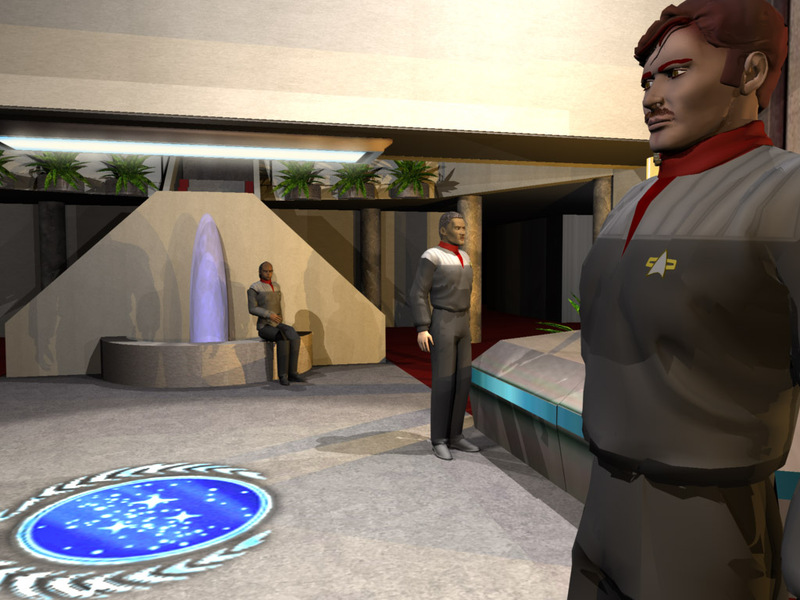 Here is one of many NEW screenshots from the upcoming animated movie Starfleet Missions II! You Are Visitor Since 6/21/2007 � 2007 The Great Escape Studios All Rights Reserved.